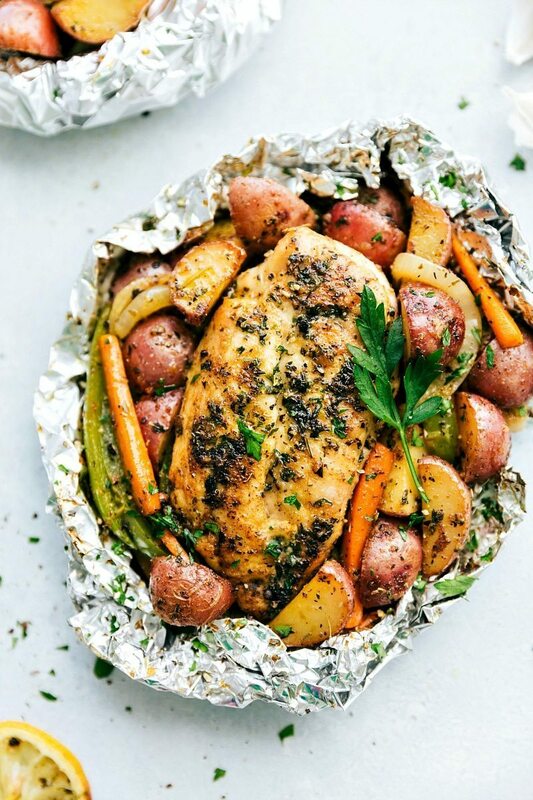 Tin Foil Packet Seasoned Italian Chicken and Veggies. I changed up the veggies a bit, but you’ve still got all the amazing Italian seasonings. Plus, this dish is just about as inexpensive to make and just as healthy. Good-for-you ingredients, very little prep, and virtually no clean-up! This dinner is a mega win! ? Chicken Breasts — you’ll want 16 ounces TOTAL for this recipe which is about 2 large breasts. Try to get 2 large breasts that are each 8 ounces and then slice the 2 breasts horizontally into two even pieces that are each 4 ounces. Pound the chicken and ensure that the 4 pieces of chicken you have are each an even 4 ounces. Red Potatoes — the potatoes are what takes the longest to cook, so it’s important to prepare them correctly so they will cooked through in time. I use baby red potatoes and then halve or even quarter them so you’ll get pretty small pieces of potato. If you use baby reds, get the smallest ones possible and halve. Larger baby reds need to be quartered and if you’re using regular red potatoes you’ll want to chop it into pretty small bite-sized pieces. Carrots — the next longest cooking veggie are the carrots. I buy regular sized carrots and cut them into pretty thin match-sticks. You’re aiming for 1- to 2-inch pieces that are about 1/8-inch by 1/8-inch thick. Onion — just thinly slice it into rings. Alternatively you can dice up the onion. Green pepper — slice into thin strips. If you’re baking these, you want to avoid removing them from the oven and checking too often; when you open the foil packet, all the steam is released and it’s going to take a lot longer to fully cook when being placed back into the oven. That said, it’s hard to know exactly when they’re done because each oven is different and ingredients are always prepared a little different. 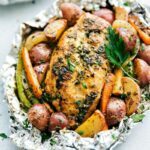 I’d recommend pulling out just ONE packet (not all) and testing at 40 minutes (see if the veggies are tender and use a meat thermometer to test the chicken). If that one’s not done, return it (it will likely need an additional 5 minutes over the rest now) and test a different one at 45 minutes. These packets (if you have the right sized ingredients and a calibrated oven) shouldn’t take longer than 50 minutes and can be done as soon as 35 minutes. 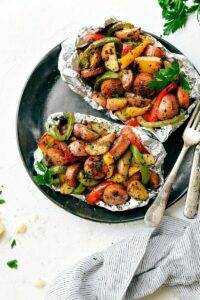 When grilling, I like to grill these over HIGH heat and actually leave a little bit of an opening at the top of the foil packet — so they’re folded up, but not fully sealed. I think it gives them a better flavor! Grilling at high heat these can be done as soon as 20 minutes depending on the actual temperature of your grill. Toss the seasoning mix and olive oil thoroughly with all of the ingredients so you get a nice even coating over everything! 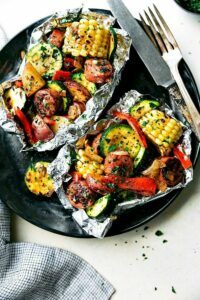 Use heavy duty foil for grilling. 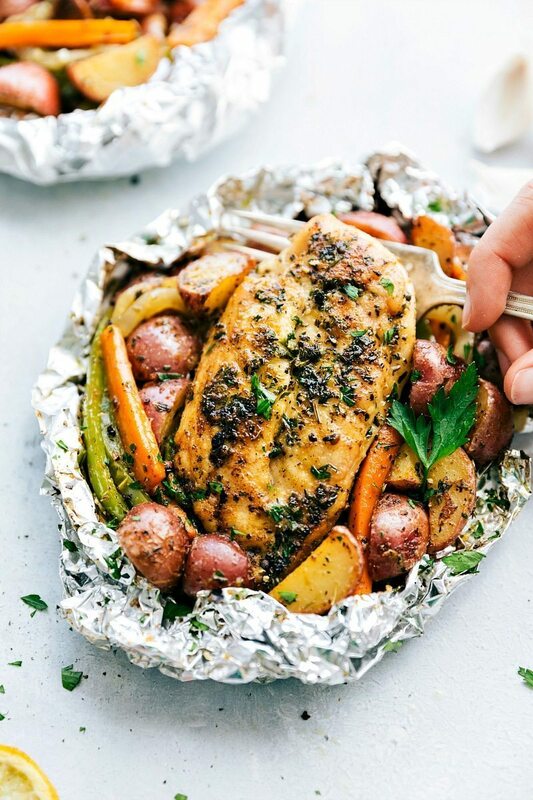 Tin Foil Packet Italian-Seasoned Chicken and Veggies. Preheat the grill to high or the oven to 425 degrees F.
Slice the chicken breasts horizontally to get 4 pieces. Pound the pieces to even thickness. Make sure each piece is 4 ounces. Prep the veggies: half or quarter baby red potatoes (you want pretty small pieces so they'll cook in the same time as everything else). Thinly slice the green bell pepper, cut the onion into rings, and cut the carrots into 1/8th inch thick matchsticks. In a very large bowl, add the chicken, potatoes, bell pepper, onion rings, carrots, and minced garlic. 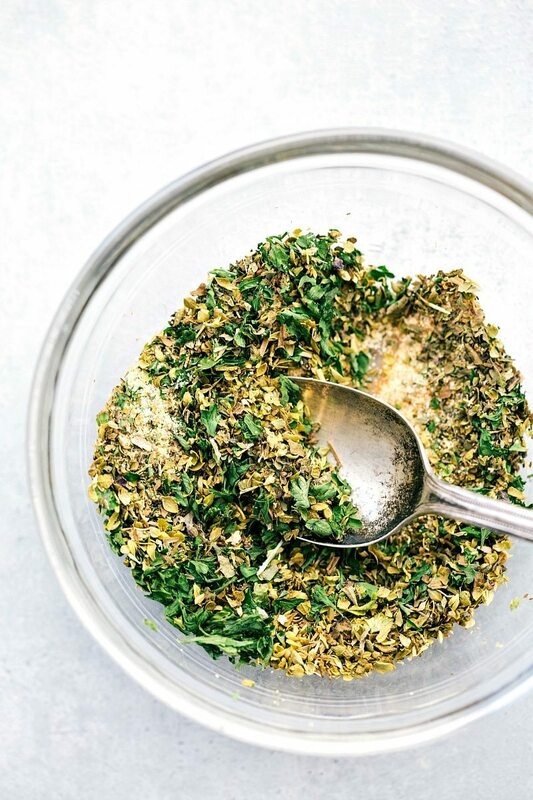 Pour the olive oil over everything and then all of the seasonings: the dried basil, dried oregano, dried parsley, garlic powder, onion powder, dried thyme, and red pepper flakes if desired. Add salt and pepper to taste (I add about 1/2 teaspoon of salt and 1/4 of pepper, but do it to your preference). Toss all of the ingredients together to ensure everything is well coated in the seasonings and olive oil. Set out 4 large sheets of foil. Divide the mixture evenly among the foil making sure each foil pack gets 1 chicken piece. Seal the foil and grill on high heat for 15-25 minutes (large variance based on different grills/heat; my grill had these finished at 20 minutes) or in the oven for 30-45 minutes (again; large variance based on your oven temperature and how ingredients are prepared) or until the chicken is completely cooked through (registers 165 degrees F). My oven cooked these perfectly at 37 minutes and a friend tested this recipe and they were done at exactly 40 minutes. 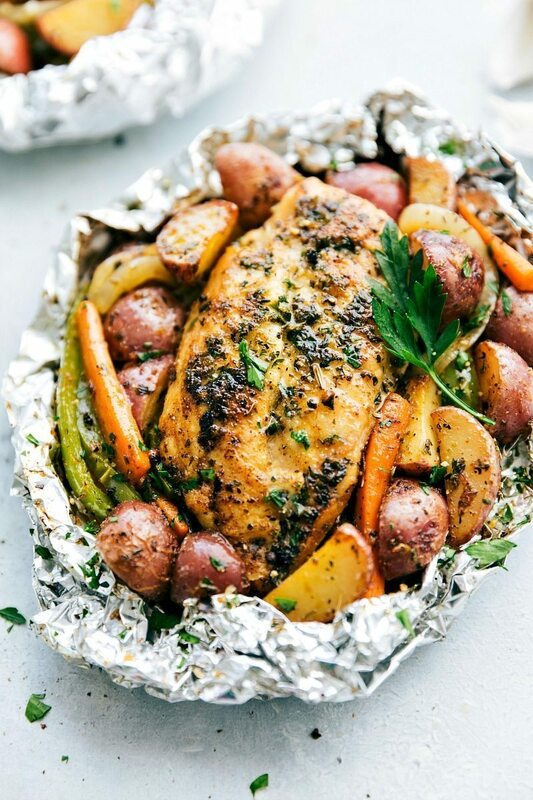 Remove the foil packets from grill or oven and open carefully allowing for the steam to escape. If desired top with fresh parsley, a squeeze of fresh lemon, and freshly grated Parmesan cheese. Season additionally with salt and pepper if desired and enjoy immediately. 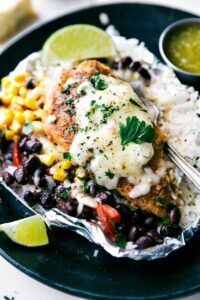 Tried this recipe for dinner tonight and it was a success! I used drumsticks instead of breasts because that’s what I have on hand. Everything came out delicious, not to mention the easy clean up. Thanks. 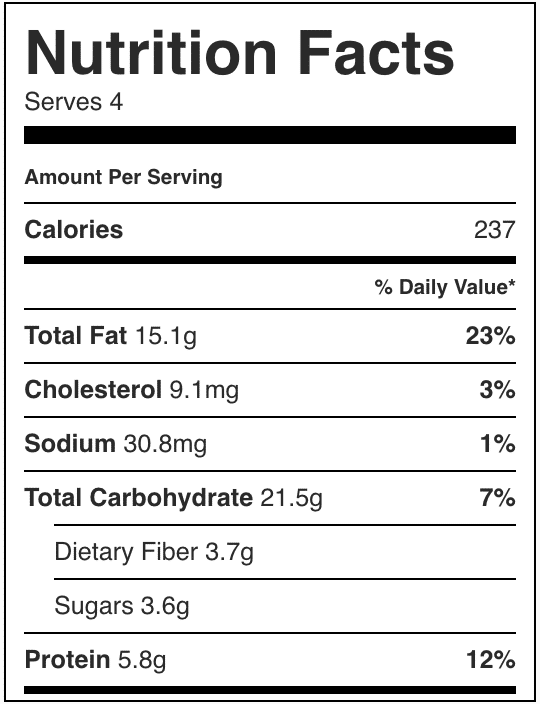 I don’t think this nutrition information could possibly be correct. 4 oz of chicken has way more than 5.8 g of protein. I made all three, chicken, steak and sausage. This Italian seasoning is to die for. I made a huge pickle jar of it! Haven’t made it yet, but added to my list! Can these sit prepped? I’m wondering if the packets could be prepped in the morning (when I have time), then just throw it in the oven when I get home. There’s no acid to turn the meat to mush, so it should be ok. I don’t see why they can’t be prepped in the morning! Enjoy! Can I use Boneless chicken thighs? I want to use these for camping, can I prepare the chicken at home and then let it marinade in the seasoning for 2 days? Then add the veggies right before we put it on the fire? If you can keep the chicken refrigerated that should be fine! 🙂 I hope you enjoy!